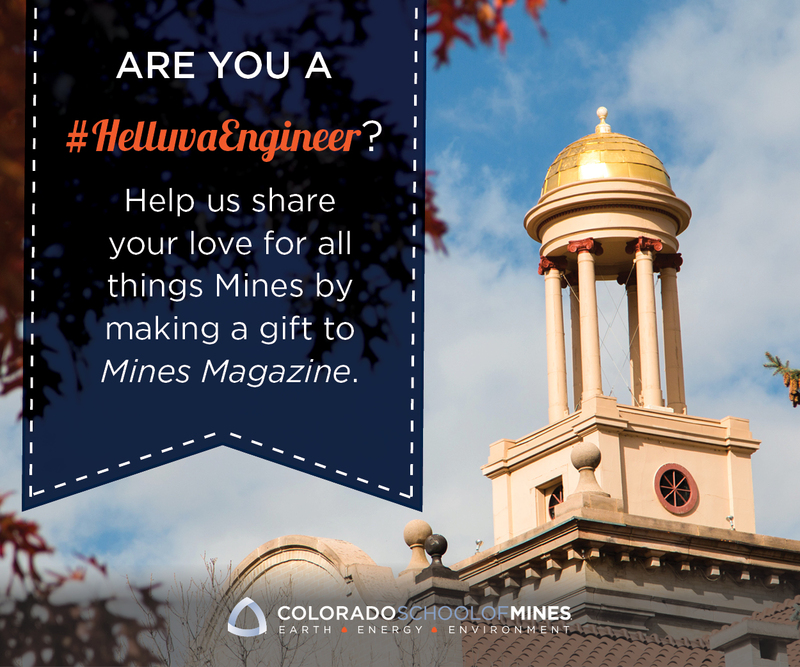 It’s been three and a half decades since, as we all say, ‘I got out.’ With the passage of time, I have learned to appreciate numerous things about the Colorado School of Mines. First, as my son James (MS Hydro ’13) told me about three weeks after starting graduate school at Mines: ‘Dad, you were right, this school is different.’ He told me this shortly after a less-than-stellar performance on his first set of exams. Even John Coors, when he recently announced CoorsTek’s gift of $26.9 million to Mines, began his speech by proudly sharing that he received a zero on his first chemistry quiz. These experiences, and there were a lot of them, are part of the filaments that join us together. It is something we are all proud of, even if it may have caused us to seek therapy at some point. Our school has changed in many ways, as have the demographics of our alumni. Still, as a whole, Mines students have continued to stand out year after year. I know this to be true, for I have recruited throughout my career at Mines and many of the other top tier engineering schools, mentored interns, and trained new graduates. I encourage all of you to see this firsthand by coming back to campus and being part of your local alumni sections. Students all seem to have a certain mentor that makes a difference to them at Mines. For my son, it was Professor Paul Santi (Department of Geology and Geologic Engineering). For me, years ago, it was Marv Kay, yes, the football coach and former mayor of Golden who is still around campus. Overall, the involvement of our students in non-academic activities is also unique; they participate in more than 180 different activities and organizations. Mines students also want to make a difference in the world, evidenced by the fact that humanitarian engineering is one of the most popular minors on campus. The music department is also a well-kept secret. Did you know they have performed at the Vatican? Still, sometimes I forget about all the good memories from the five years I spent on campus. But last weekend, fate stepped in to correct that when I was in Houston for a Discover Mines event. Louisa Duley, assistant director of admissions at Mines, asked me to meet with her and a prospective student named Grace. Grace’s mother, Jennifer Merkel, instantly recognized me as one of her husband’s (Ernie Merkel ’81) fraternity brothers. For the next two hours, Grace told me many stories about Ernie and other Mines families they had stayed in contact with over the years. We laughed remembering the good times. Then as Grace explained her passion, to follow her father’s path to Mines, we talked about the hard work and how it changes and defines who you are, and tears came to our eyes. Ernie died 14 years ago of cancer, but the difference that Mines made in him lives on in his daughter. John F. Kennedy said, ‘God’s work must be our own.’ Likewise, the work of our school must belong to all of us. I look forward to the honor of serving you as president of the Alumni Association, because Mines and each of you are part of who I am. My mentor both Undergraduate and Graduate was Franklin Stermole. I would not have had the same career without him.